People involved: Carlo Carolis, Thomas Pengo and Maria Guirola. The SysteMTb project aims at providing a rational framework to understand mycobacterial physiology during infection and to identify essential nodes that are optimal for effective therapeutic interventions. Tuberculosis (Tb) is a re-emerging global health threat caused by Mycobacterium Tuberculosis (MTb). One third of the world’s population is infected with MTb; and new infections occur at a rate of one per second. 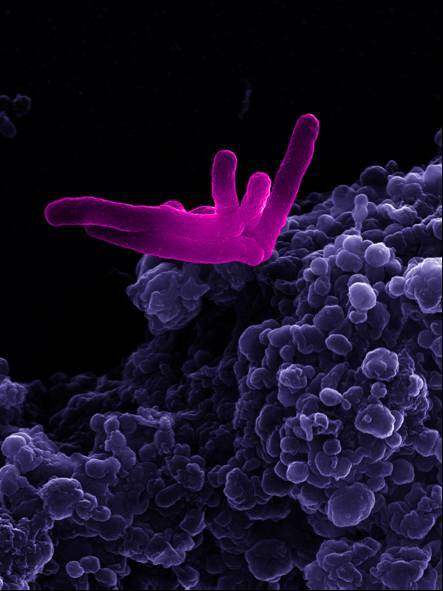 Despite global research efforts, mechanisms underlying pathogenesis, virulence and persistence of MTb infection remain poorly understood. MTb infection is best described as an equilibrium involving a balance of activation and suppression of host responses, orchestrated by a complex and dynamic series of interactions between multiple host and bacterial components. Simple reductionist approaches are insufficient to understand this complex biology. The core strategy underlying the SysteMTb project is that a systems biology approach intertwining experimentally-driven model development and model-driven experimentation will provide improvement in understanding this threatening bacterium and will be pivotal in designing rational strategies for preventive and therapeutic interventions. This entails the progressive elucidation and thorough analysis of the structural scaffolds and cellular wiring of MTb through the measurement of its global responses (metabolomics, lipidomics, proteomics, transcriptomics, glycomics) upon perturbations (chemical challenges, knock-out/knock-down mutants, etc.) which are relevant for infection, more specifically macrophage infection. Twelve partners from all around Europe belong to this consortium, from academia to biotech, along with many collaborators. Luis Serrano is the Coordinator and participates in Sub-project 1 - Protein function and complexes, namely generating a library of all Mtb YFP-tagged proteins that are available for the comunity (see next) and doing the funcional analysis of these clones. SysteMTb yields scientific publications, protocols and software developments which are basing on the partners’ highly sophisticated infrastructural and human resources. The Mycobacterium tuberculosis H37Rv ORF YFP Fusion vector collection was developed by our research laboratory. It is a library of low-copy plasmids bearing gene-YFP fusions. An Mtb vector (pKW08) containing the TET regulated promoter was engineered with N-terminal enhanced yellow fluorescent protein (eYFP) tags to create a new destination vector (pKW08- eYFF-RfaccdB). The step in generating the fluorescent-tagged Mtb-ORFeome expression library was the transfer of ORFs from the Mtb ORFeome entry vectors in the new pKW08-eYFP RfaccdB-C using the Gateway LR recombinase reaction. YFP vector mycobacterium clones available at the CRG. Questions relating to the clone requests should be made to Carlo Carolis using the contact details: carlo.carolis@crg.eu Ph: +34-933160266. Link to the consortium Web site. With the colaboration of the CRG Advanced Light Microscopy Unit.